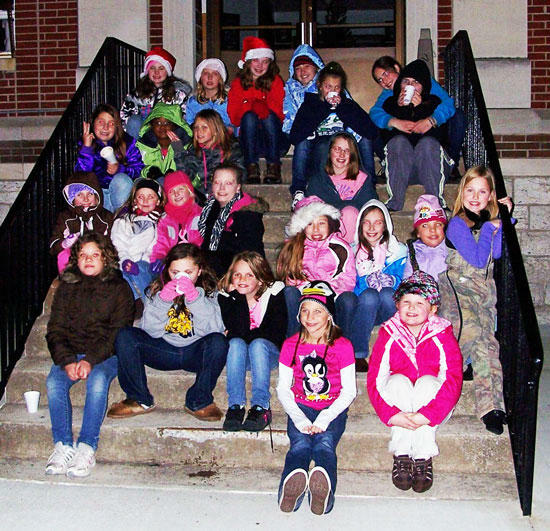 The Girl Scouts of Cannon County decorated the county Christmas tree in the gazebo at the courthouse Thursday night. All of the troops in the county particpated by making ornaments for the tree. Twenty five of the girls helped to decorate the tree. They sang Christmas carols, played games and drank hot chocolate as well as decorating the tree. The Girls Scouts would like to make this an annual event. Cannon County executive Mike Gannon made the tree available for the Scouts and had it set up and ready for the event. I saw the tree when I attended the Christmas Open House and I made my 4-year old neice's picture in front of it. It was beautiful! Great job girls! Looks like it was a cold night to decorate the tree too. It is good to see we have these active girls in our county doing a fun, service activity like this.